On Thursday, my fiance and I headed down to the more southern parts of England to visit Stonehenge and two medieval cities, Winchester and Salisbury, with a bit of camping in between. Stonehenge was first as it was on our way. I can’t tell you how impressive it is in person. Making the turn off the highway, it appears suddenly on a hill and is simply awe-inspiring. It’s even more so up close. You can’t touch the stones, but they do let you get closer to them than I’d expected. Afterwards, we were off to the camp site, to set up our new tent. 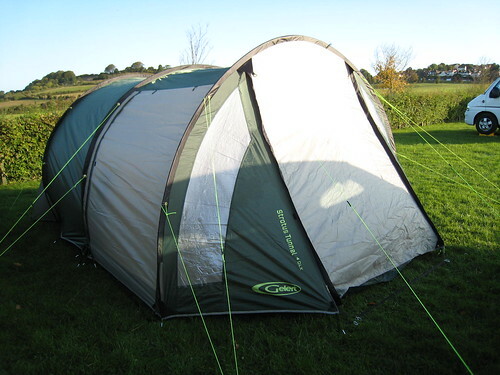 We had a lot of trouble with our tent and ended up with four people helping us put it up. The poles that came were a bit too long and for some reason the straps were not adjustable. Keith knew it was too good to be true, as he got it on sale. We made it work in the end and we have better ideas on what to do next time. The next day, it was out to Winchester. Jane Austen’s house was fairly near Winchester, but not close enough for us to do everything we could in the city and go out there, so we didn’t. 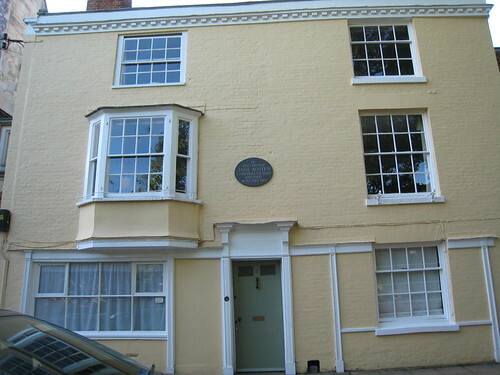 We did visit Winchester Cathedral, where she is buried, and the house in which she died. 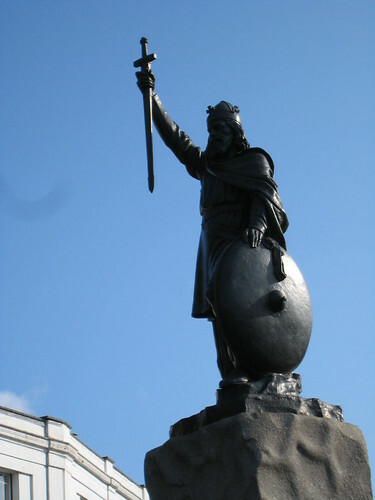 Winchester was the Anglo-Saxon capital of England, so there were many memorials to Alfred the Great scattered about, including this Victorian statue, and the place where his bones may rest. No one knows what actually happened to Alfred’s bones, or those of his wife and son, which were moved at least three times. 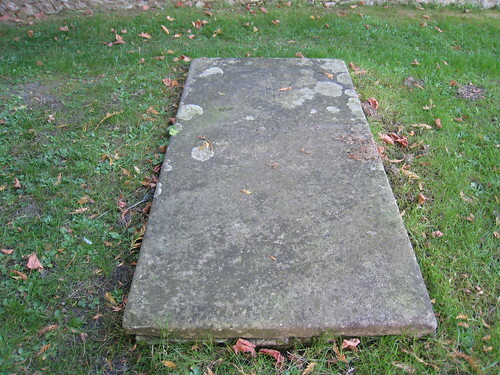 His grave was looted after Henry VIII’s break with the Catholic church and his bones were either scattered or re-discovered in the 18th century. 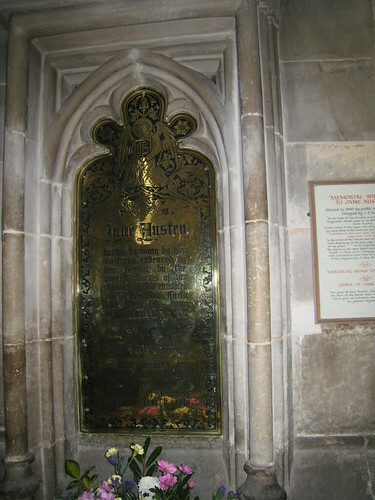 The bones that were discovered by an amateur archaeologist were buried here, in St. Bartholomew’s Church, in a simple grave marked with a cross. 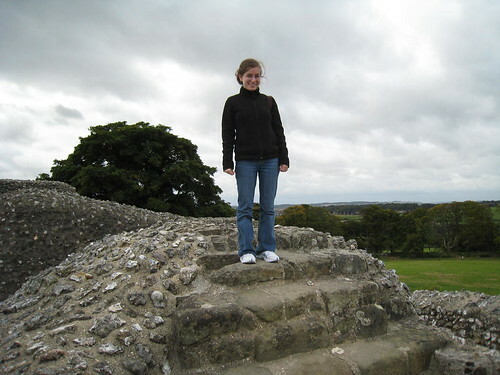 Yesterday, we went to Old Sarum and Salisbury. I’m not sure if any of you have read Sarum by Edward Rutherfurd, but these are the places that he mentioned. The castle is unfortunately in ruins now; in the 18th century, again, the king gave permission for it to be demolished and its stones used as building materials. All that remains is an outline and the rubble that occupied the interior of the walls. 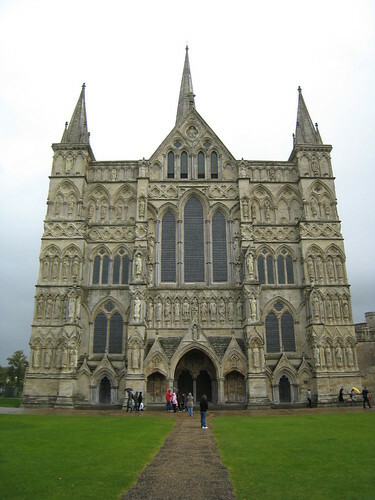 And in Salisbury, the best part was definitely the cathedral. It’s a miracle this cathedral is still standing; it has only four feet of foundation, the pillars have bent over from the weight of the tower, and the whole thing sits on a bed of wet gravel. They assume the wet gravel is holding the cathedral and check every day to make sure there’s still enough water beneath it. I’m not sure what they’d do if there wasn’t. While there, I continued reading The Name of the Wind by Patrick Rothfuss. It’s taking me forever to read this book thanks to being away, but I’m completely loving it. I’m looking forward to sitting down with it and finishing it tomorrow – only to wait until next year for the sequel, and probably 2010 for the third installment! I can tell I’ll be revisiting this book before the rest of the series is out. Of course, I managed to acquire a few books in Winchester and Salisbury; the camp site had a small shelf of books for 50p each, where I acquired The End of Mr. Y . There was also a sale on in Winchester to support the Deanery associated with the cathedral, so I picked up three more books there, and my fiance bought me Azincourt , Bernard Cornwell’s newest book, as a gift. What a wonderful trip and what beautiful pictures. I’d say you’re in your element there. Thanks for sharing the pictures and the narrative of your trip so far! I can tell I’m going to enjoy living vicariously through you on your trip. What a fantastic trip! I love your pictures. I read The Name of the Wind about a year ago and really enjoyed it. I plan to reread it when the next one is out so I can go through them back to back. I thoroughly enjoyed ‘The Name of the Wind’. I thought he really made the detail count and I’m definitely waiting on the next one. I’m glad you’re enjoying yourself here in the UK. Wow! What an awesome trip you describe–so rich with history. And I love the pics. Thanks for sharing them. One day I hope to get over there and to Scotland. 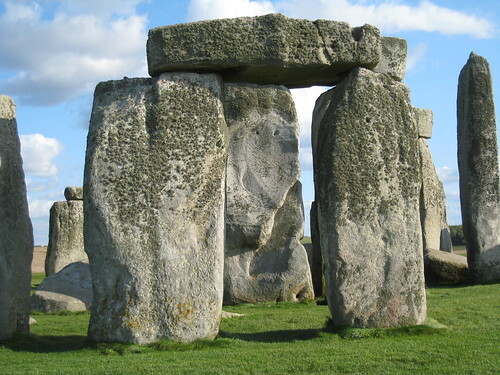 I would love to see Stonehenge and meet some of my family. The cathedral is beautiful! Thanks for sharing. I’m so jealous! Edward Ruther ford’s Sarum was wonderful–and believe it or not, I didn’t know there was an actual city of that name! PS–I knew you’d be buying books when you got to England! Once you start, you can’t stop because there are some covers that publishing companies over there do that are irresistible. I was over there seven years ago and had to buy a whole new bag just to carry the books I “had to buy” in London and Oxford! Enter Waterstones at your own risk. My understanding is that Rothfuss has all of them written already, but they’re being released one at a time (like the Lord of the Rings movies, I guess). I can see why the publishers might do that, but it’s annoying for the readers to know they’re out there, but we just can’t have them! The only time I’ve been to Stonehenge it was dumping rain and super-cold, so I didn’t spend a whole lot of time out looking at it. Looks like you had a better time. Thanks for sharing your pics, the cathedral is gorgeous. 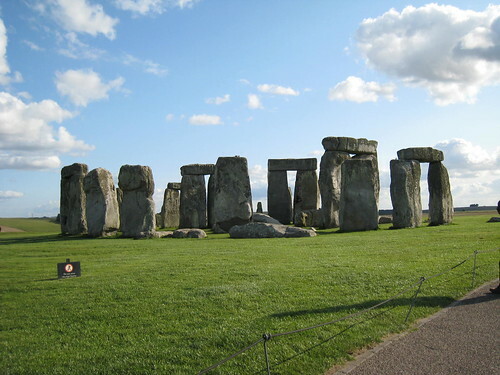 And stonehenge, I’m jealous. Thank you so much for the pictures. You look like you’re at home in that one picture! I’m so glad you’re having a good time there and please continue to post pictures. They’re nice to day dream to! Isn’t Stonehenge a wierd place? It’s out in the middle of nowhere, and it seems both larger and smaller than it should be, somehow. I was quite impressed. Your trip sounds fantastic! How wonderful! I love this post and I am so happy to have all the pictures to keep returning to. I would be jealous if you weren’t so good at sharing. You lucky girl! My husband and I went on basically the same trip years ago, one of our favorite trips ever! Did you climb to the top of the spire of the Cathedral? That was the highlight for us, just us and the tour guy, climbing up for a tour of the roof and looking out from the spire over the city. You could see for miles. Looks like you had beautiful weather, too! Great post and pictures! Meghan, what amazing pictures of an amazing trip! That castle is gorgeous. And look at you … you’re adorable! Thanks for sharing and I look forward to more in the future.